THE EASIEST WAY TO ENHANCE YOUR PRESSURE TREATED WOOD. Beautify and enhance your pressure treated deck. Protect the natural brown tone or convert green pressure treated wood to a translucent brown wood tone with Pressure Plus wood treatment. 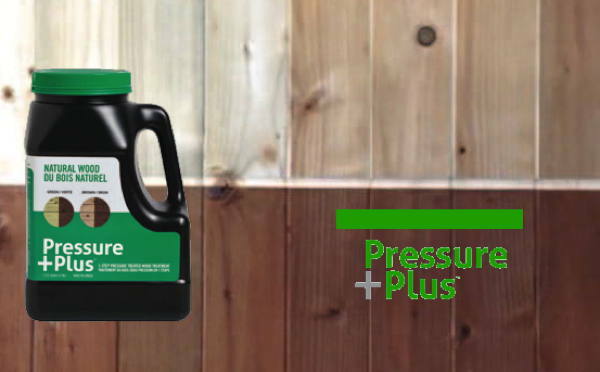 Pressure Plus is engineered to improve the performance of pressure treated wood. It's designed to enhance and improve dimensional stability by reducing moisture absorption significantly during wetting periods. Just one coat will have lasting effects on the beauty and performance of your wood. Pressure Plus is now available at both Days Painting Supplies stores, visit our website for more information.